Herbert Puchta and Jeff Stranks: English in Mind: Combo Starter B (+ CD-ROM) - Cambridge University Press, 2007. Henry Lunt: CIMA Exam Practice Kit: Fundamentals of Financial Accounting - Elsevier, CIMA Publishing, 2006. Henry Lunt: CIMA Official Learning System Fundamentals of Financial Accounting - CIMA Publishing, Elsevier, 2009. Harvard Business School Press, Harvard Business Review: Harvard Business Review on Work and Life Balance (Harvard Business Review Paperback Series). Harvard Business Review: Harvard Business Review on Turnarounds. Harvard Business Review: When Change Comes Undone (Harvard Business Review Management Dilemma Series). Harvard Business Review on Leadership - Harvard Business School Press, 1998. Harvard Business Review on Entrepreneurship - Harvard Business School Press, 1999. Hidetaka Yoshimatsu: Internationalization, Corporate Preferences and Commercial Policy in Japan (Macmillan Business (Series).). Halil Inalck, Donald Quataert: An Economic and Social History of the Ottoman Empire, 1300-1914. Harvard Business Review on Developing Leaders. (HARVARD BUSINESS REVIEW PAPERBACK SERIES). Harvard Business School Press, Peter F. Drucker, John Seely Brown: Harvard Business Review on the Innovative Enterprise (The Harvard Business Review Paperback Series). Henry William Chesbrough: Open Innovation: The New Imperative for Creating and Profiting from Technology - Harvard Business Press, 2003. Harvard Business School Press: Face-to-Face Communications for Clarity and Impact (The Results-Driven Manager Series). Harvard Business Review: When Good People Behave Badly (Harvard Business Review Management Dilemas). Harvard Business School Press: Winning Negotiations that Preserve Relationships (The Results-Driven Manager Series). Harvard Business Review: When Marketing Becomes a Minefield (Harvard Business Review Management Dilemas) - 2004. Harold Hill: A Portfolio of Lunar Drawings (Practical Astronomy Handbooks) - 2003. Harvard Business Review on Managing Yourself - Harvard Business School Press, 2005. Heike Bruch, Sumantra Ghoshal: A Bias for Action: How Effective Managers Harness Their Willpower, Achieve Results, and Stop Wasting Time - Harvard Business School Press, 2004. Howard Gardner: Changing Minds: The Art and Science of Changing Our Own and Other People's Minds - Harvard Business School Press, 2004. Harvard Business Review on Bringing Your Whole Self to Work (Harvard Business Review Paperback Series) (Harvard Business Review Paperback Series) - 2008. M. A. K. Halliday, Christian M. I. M. Matthiessen: An Introduction to Functional Grammar - A Hodder Arnold Publication, 2004. Harvard Business Review: On Managing Through a Downturn (Harvard Business Review Paperback) - 2009. Herbert A. Simon: An Empirically-Based Microeconomics (Raffaele Mattioli Lectures) - 2009. Howard Q Little III: One Academic Journey Through an MBA Program: A University of Phoenix experience - 2009. Hasan Fakhruddin, Joseph J., Ph.D. Molitoris: GRE Physics Test: REA: Serious Prep for the GRE (REA Test Preps) - 2010. Handbook of Internet Crime - 2010. W. N. Herbert: Writing Poetry - 2010. 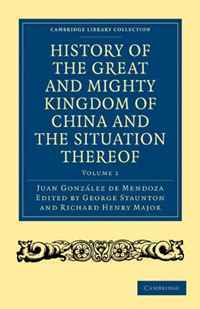 History of the Great and Mighty Kingdome of China and the Situation Thereof: Compiled by the Padre Juan Gonzalez de Mendoza and now reprinted from the ... - Travel and Exploration) (Volume 1).